The D.R.E.W. 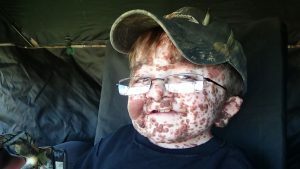 (Discovering Recreation & Enjoying Wildlife) Foundation (a non-profit organization) was founded due to the inspiration of a handicapped young man by the name of Drew Foster. The D.R.E.W. Foundation, in conjunction with Bad River Outdoors, sponsored a fund raising event to provide Drew with an Action Trackchair™. The D.R.E.W. Foundation was formed for the purpose of providing handicapped persons with resources and abilities to discover and enjoy the experiences in nature that they have previously only been able to dream about. Drew Foster lives and goes to school in Flushing, Michigan. Drew truly loves the out-of-doors and hunting. However, he was born with brittle bone disease and has experienced over 50 broken bones in his young life. At the time Drew was born doctors told his parents that he wouldn’t live beyond the age of two or three years. However, he has miraculously beaten those odds (he turned 13 in January, 2013) and each day is a gift to both Drew and his parents. As heartbreaking as this was, no one was prepared for what they saw when they looked at Drew. He was covered in dark brown birthmarks and moles…all over his body. Diagnosis: neurocutaneous hypermelanosis, a very unusual skin condition. According to the medical experts, no one has ever seen the combination of these two diseases in one child. In children who develop moles diffusely throughout the body, there are two things to keep in mind: (1) the individual moles on the skin can become cancerous; (2) the coverings of the brain and spinal column of these children also have spotting. However, to continue the story, he now is doing very well in school, he has many friends and loves life — he is a TRUE miracle! If you don’t believe in miracles, come and meet Drew! Because of the diseases Drew is not capable of using a gun to hunt with, but is able to use a crossbow. He has experienced success at both deer and turkey hunting, and it had long been his dream to accompany his Dad during his hunts. Drew was previously been limited to an electric wheel chair to get around or having someone physically carry him to and from a hunting blind. 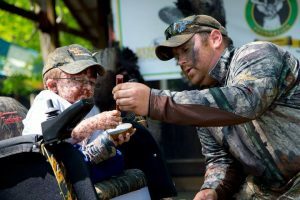 In 2011 Drew was able to “test drive” an Action Trackchair™, and it gave him the freedom and flexibility to get around in the outdoors that he loves so much. He was able to use the chair to play in a mud puddle for the very first time in his life – something other children do at a very young age. In December, 2012 The D.R.E.W. Foundation, in conjunction with Bad River Outdoor, was able to give Drew an early Christmas present – his own Action Trackchair™. This was made possible by the generosity of many donors. Our hope is that those of you who have the ability and desire would assist us in reaching our goal of providing other physically challenged individuals with the chair and help them to realize their dreams of being somewhat independent and enjoying the out-of-doors. A PayPal account has been created for your convenience to donate to this worthy cause.